• Respite Care: A gift of time. Respite care enables families to take vacations, or just a few hours of time off. 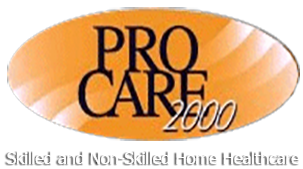 All Caregivers and staff are employees of ProCare 2000 and not 'hire as needed' independent contractors. Each member is thoroughly screened with extensive multi-state background checks, DMV record pulled and California Department of Health records. We are insured, bonded and covered by workers compensation. This protects not only our dedicated staff but our clients and their property as well.